This just in: 14-time Grand Slam champ, Olympic gold medalist, and Tommy Hilfiger underwear model Rafael “Rafa” Nadal just got married… to a man! The fictional marriage happened in Peter Gil-Sheridan new Off-Off-Broadway play “The Rafa Play,” which is being produced by The Pool, a pop-up theater company. Gil-Sheridan says all that fantasizing about things he would never have started to make him feel like a “loser” and an “utter failure.” He looked at Nadal, who seemed to have it all–money, fame, good looks, an accomplished career–and got to thinking: What would it be like to be married so a guy like that? “The Rafa Play” centers around a gay character (loosely based on Gil-Sheridan) and his dream marriage to the 31-year-old Spanish tennis superstar. Of course, things aren’t all they’re cracked up to be, especially once the realities of Rafa’s professional demands and constant touring kick in. 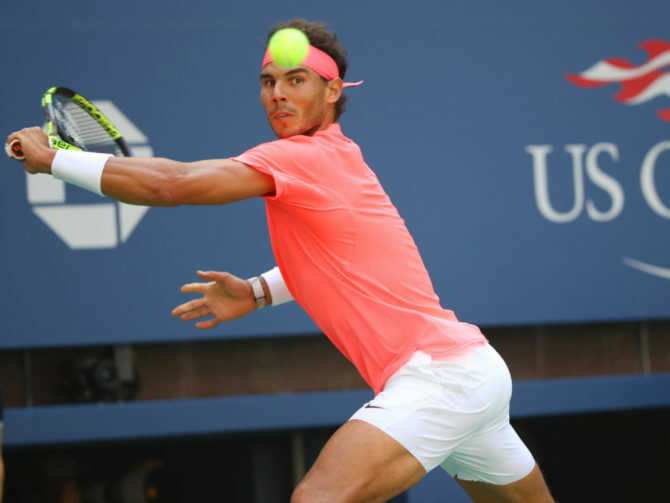 It’s not what would be akin to a biopic; Rafa functions as symbol in the play. I think, in that way, so many of these top tennis players function as symbol to us. Like Serena Williams: She is such a huge symbol in our culture. But who is Serena the woman versus Serena the symbol? I think it’s similar for Rafa. And for me, as a gay man, him as a masculine ideal is what I’m looking at. So it’s kind of him, and kind of not him. It’s a funny thing. He’s not being portrayed as a gay man; he’s being portrayed as a gay icon. For the record: Nadal isn’t gay and has actually been dating his girlfriend, Xisca Perelló, since 2015. Neither he nor his team have any connection to the play and were not involved in any part of its development. Ah, I could smell the fetid stench of “click-bait” on this headline from across the room. Congratulations Queerty, you’ve hit a new low! Queerity… It’s like you’re not even trying. Yes! Even a symbolic marriage between two men is worth mentioning. No it’s not. It’s not even remotely worth mentioning. It’d be worth mentioning if Nadal was actually in the damn play, and not something loosely based on some fantasy that he’s not even involved in. All you mopes who make the effort and spend the time to write one of those oh, Queerty, why ever did you publish such an article, I just knew that it would be awful, and I just can’t stand that you printed it (clutch pearls) — why? Why do you do that? I’m genuinely asking and curious. This particular story is about a gay-themed play, and the headline, while misleading, was misleading in a way which A) was clearly misleading to anyone who has been paying attention and B) misleading in a way which I personally thought was sort of cute. I personally read the story, found it interesting, thought for 0.2 seconds about whether Nadal’s people will get upset if they hear about it, and then decided to go on with my day, including this post about all of you grouches (or Grinches, to be season-appropriate). No one is forcing you to visit this portal, and no one has appointed you chief poobah over content. Please calm down.